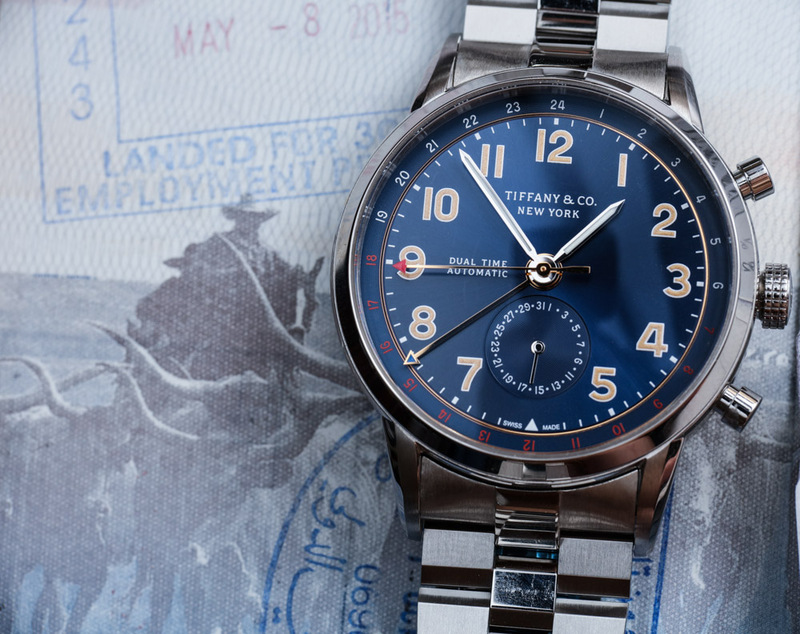 Following the successful launch of the CT60 collection last year, Tiffany & Co Watch is now introducing a brand new model featuring a second time zone indication, the brand new and funny CT60 Dual Time Automatic. A very useful complication for travellers and whoever needs to interact with people in another country, the second time zone function featured in the impressive CT60 Dual Time is extremely easy to use. The local time zone can be quickly adjusted by using the two push-buttons which give the swiss luxury watch the look of a chronograph. The 2 o’ clock pusher is used to move the main hour hand forwards, whereas the 4 o’ clock pusher moves it backwards. The home time is indicated by a hand with an arrowhead blue tip on the outer 24-hour ring. To make it easier to differentiate between day and night, blue numerals are used for the top half of the ring, from 6 p.m. to 6 a.m., and red for the lower half. The date, positioned at 6 o’clock on a micro dial, can be adjusted via a corrector located on the case band at 8 o’clock. Continuous seconds are indicated by the red-tipped hand. 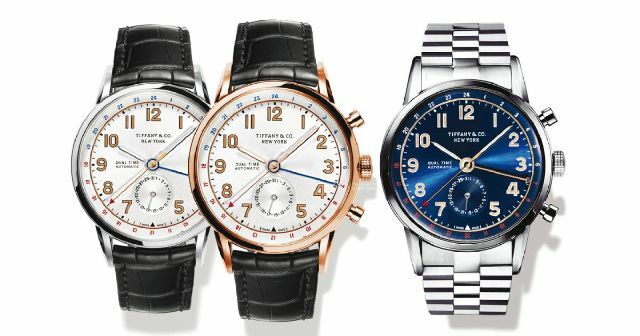 Offering water resistance to 100 metres / 330 feet, the 40 mm rounded cases of the appreciated Tiffany CT 60 Dual Time houses a Swiss self-winding movement hand-finished using the traditional Cotes de Geneve, Colimacon and Perlage techniques and visible through the sapphire crystal case back. Beating at 28,800 vibrations per hour and equipped with an advanced shock absorption system, the movement guarantees a power reserve of 42 hours. 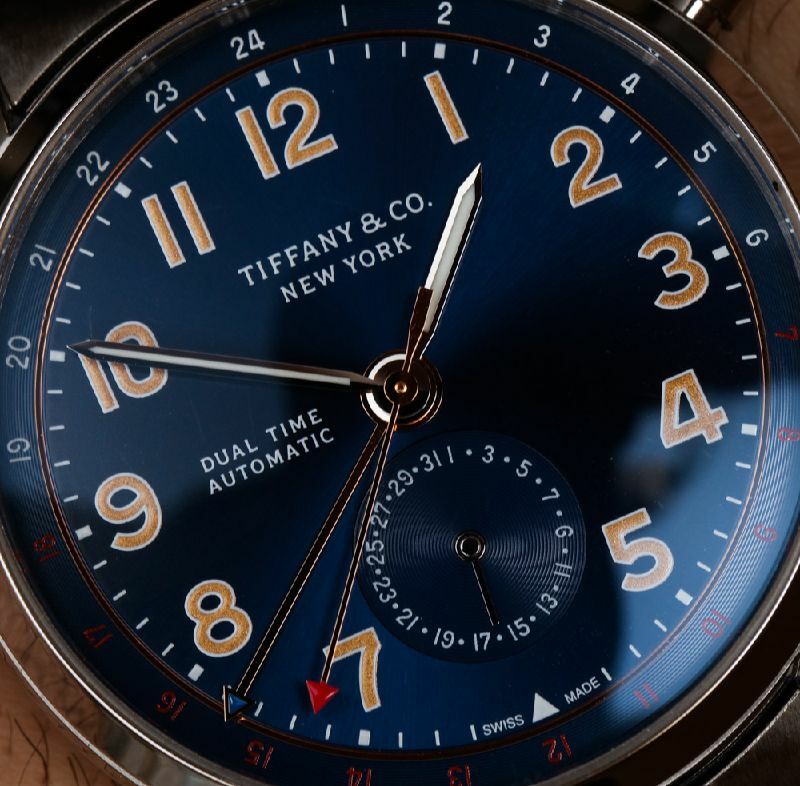 All dials of the fancy Tiffany CT60 Dual Time Automatic are enhanced by gold poudre numerals, a decorating technique where real gold is crushed into a fine powder, made into a mixture and painted onto the dial.